Hi friends, how have you been? While the heat has lingered here these past few weeks, we know the inevitable change of seasons is just around the corner. So in the meantime, we are soaking in the sunshine and enjoying as much time as possible outside. Our two year old is definitely an outdoors man; he enjoys all things nature related. He's also a big fan of painting. 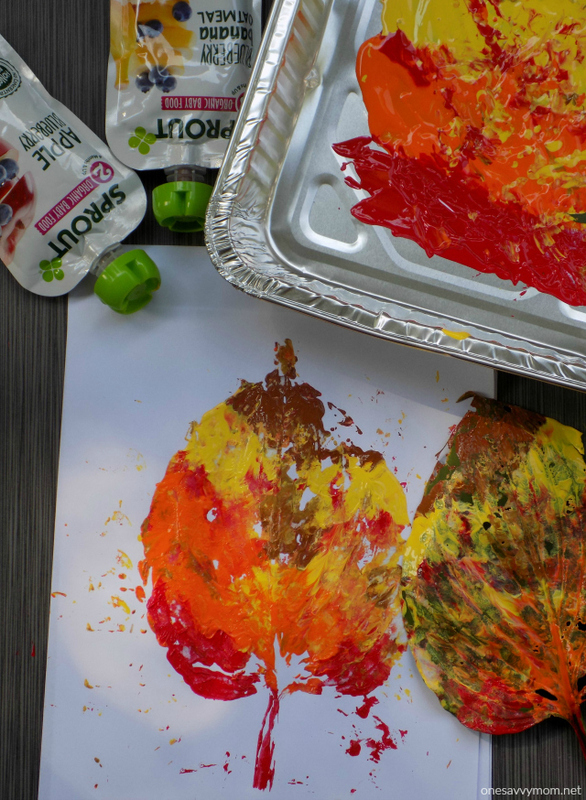 I decided to incorporate his two loves into a fun fall leaf stamping activity this past week, and I must say, it was a hit! First, we took a long walk around the neighborhood and collected an assortment of leaves. 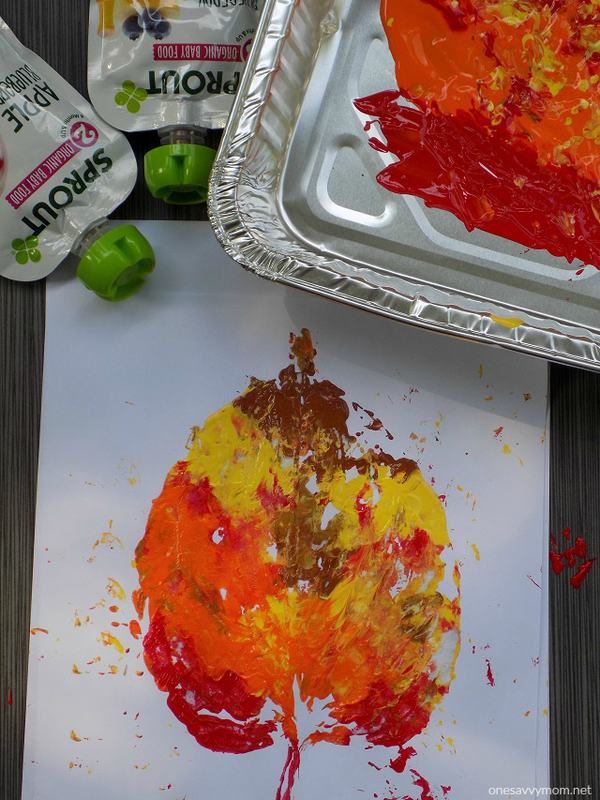 Read on for a full supply list and our step by step tutorial / imagery, on how to do this fun fall leaf stamping toddler activity. After we had gathered some sizable leaves on our nature walk, we came home for a snack and to gather all of the remaining supplies for the craft. 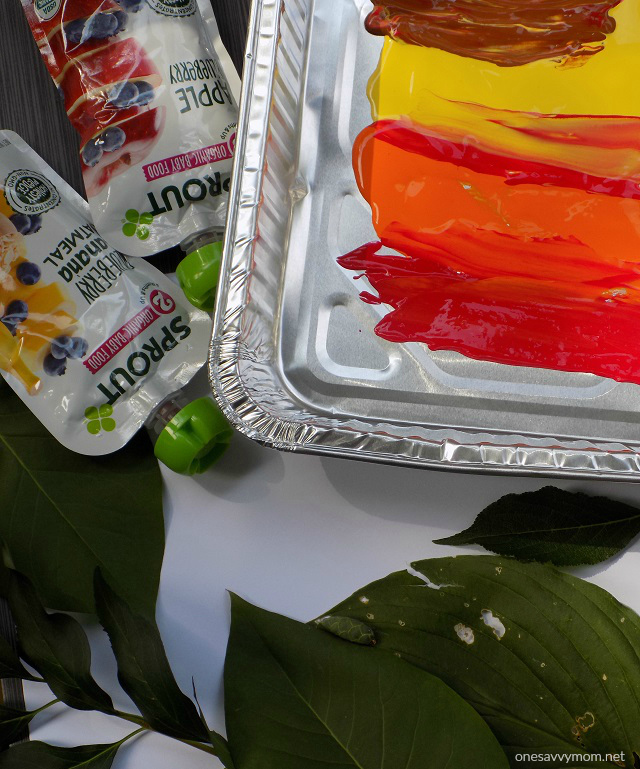 Start by adding your paints to the bottom of your foil pan. Add a small amount of paint in each color then tilt the pan to the side to spread the paint out a bit. 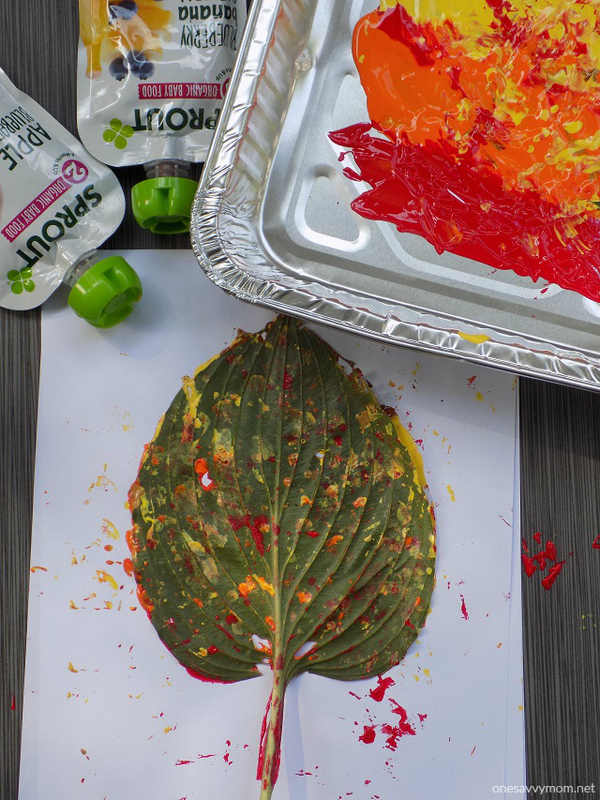 Next lay your leaves (or leaf) down in the paint in the foil pan. Press it down making sure that the face of the leaves (or leaf) is completely covered in paint. When your leaves or leaf stamp (s) has been covered in paint, press it to the surface of your heavy craft paper. Allow your toddler to "pat" the leaves or leaf, making sure that the entire painted surface has been pressed well to the paper. This is such a fun activity to do with toddlers and young children, to commemorate the season. As the seasons change, I've been searching for new ways to fill our days. My older children are occupied with school during the week, which leaves tons of time for my toddler, my newborn and I to explore, learn and have fun. So, what have I come up with? Daily craft ideas, learning fun with a few new educational apps and online programs, and a toddler gym class that meets twice a week. I think it will be a nice change of pace, after a very laid back relaxing summer. While the schedule will change for us this season, there's one part of our routine that remains very much the same - no matter what's on the daily agenda. Meal and snack times. It's the one non-negotiable for my little guy. He has 3 meals and 3 snacks like clockwork, each and every day. Whether we're at home or on-the-go, his preferred snack is always Sprout Organic Foods pouches, in one of his many favorite flavor combinations. 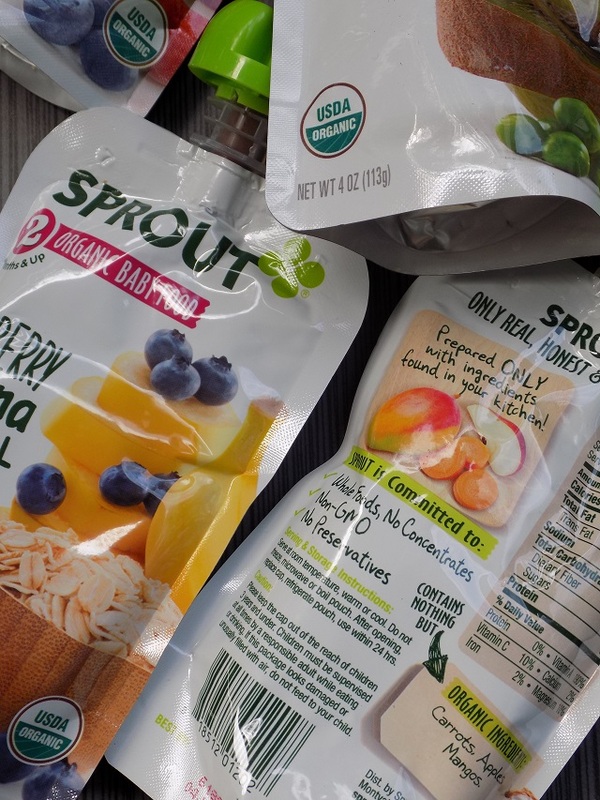 He loves the taste and as a mom I love that Sprout only uses ingredients like those that would be found in your own kitchen - no preservatives and nothing artificial! Check out the ingredients list on the back of the Sprout pouch pictured above; nothing but organic goodness! Last weekend, I made a run to our local Babies R Us with the kids to stock up on Sprout pouches and take advantage of their current offer. Now through October 2, 2016, you can receive a $10 gift card with a $25 Sprout purchase - it's a great deal! 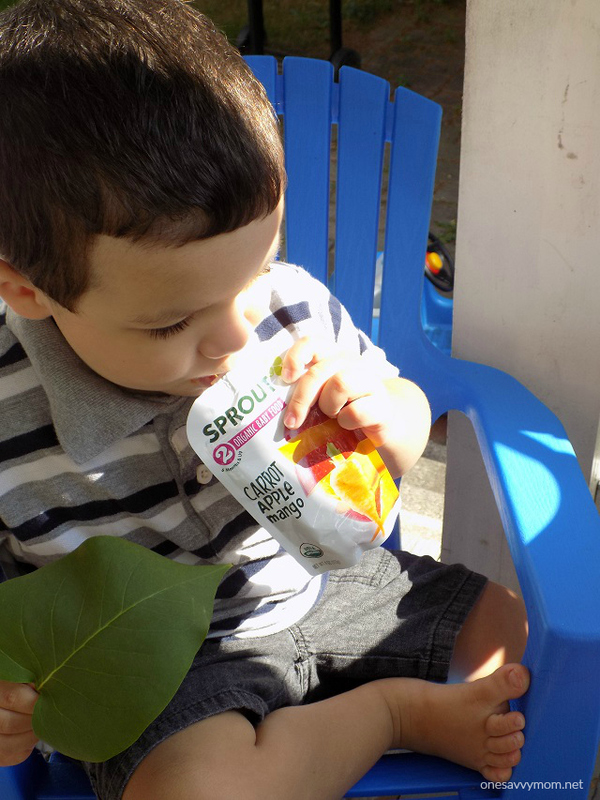 While I was at Babies R Us I grabbed a few pouches from competitor brands - to share the ingredient lists with you, and to show you why I choose Sprout for my kids. Many other baby food pouch brands contain a bunch of ingredients that are NOT listed on the front; some even contain preservatives. I don't know about you, but if I can't pronounce an ingredient or identify what it is, I don't want to feed it to my child. With Sprout, I never have to worry about that; what you see, is what you get! I'm so glad that I did this comparison for myself when I was choosing baby food for our children, and I encourage you to do the same. 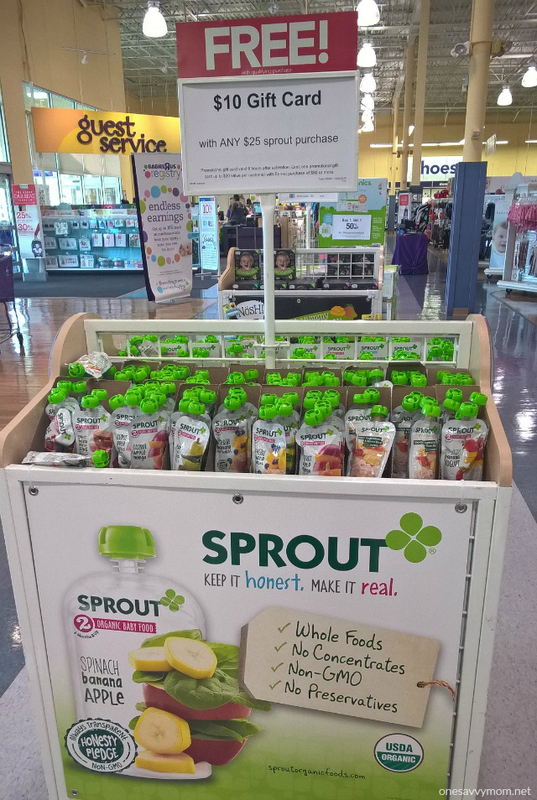 Sprout offers delicious blends of whole fruits, vegetables, and grains giving babies and toddlers greater exposure to wholesome foods. 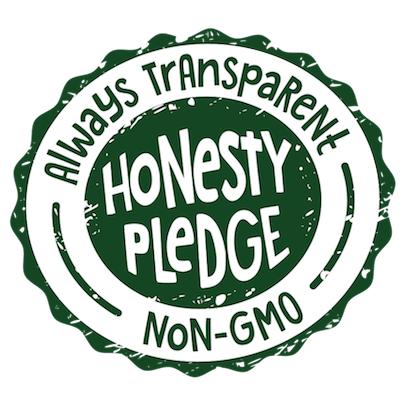 Research shows that developing a love of healthy foods early on helps foster healthy eating habits for life. I'm so grateful to have found Sprout when my toddler was just a few months old. Now, I can't wait to start our youngest off with Sprout, in just a few short months. This is such a gem of a brand that truly cares about their consumer; they've won us over completely. Visit the Mission & Values page to learn more about Sprout. Happy Crafting & Happy Fall everyone! What a fun idea. I will have to do this with my grandsons, they will love it. Hi there :) Thank you! Such a fun way to enjoy a little creativity / time outdoors with curious toddlers! This would be so much fun to do with the grandchildren.